What is Your Bird's Personality? Every bird has its own unique personality, likes and dislikes. Some are extroverts and like socialising. Others are shy and feel more comfortable with just one or two friends, preferring to sit quietly by themselves till the crowds have gone. Some are bold and daring, ready to try new things. Some love singing and will croon loudly. Some never stop chirping and have much to say, while others will have their regular chat-times in the day when they will sit in their favourite nook and chortle. And some are bossy, and lose no time in sending the others off to their bidding. There will always be some bird who is in alarmist, crying wolf at the smallest shadow and sending others off in a frenzy. The best way to observe them is at the water bath. Their behaviour and sound will give you many clues about their personality. 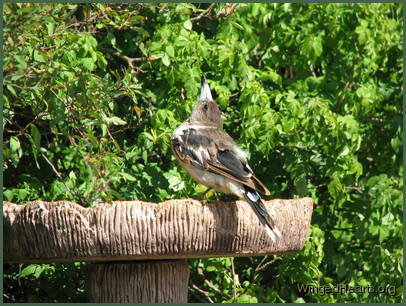 How a bird behaves when it is at the water bath, eating, drinking or just roosting on the perch is as characteristic of each personality as it is humans and animals. Does the bird take over, or does he give others a chance? Does he sing after a bath while preening himself? How long does he indulge himself? How does the bird handle its food? Cindy magpie loved scrubbing every piece of food in the grass while her sister Tammie picked up each piece cleanly. 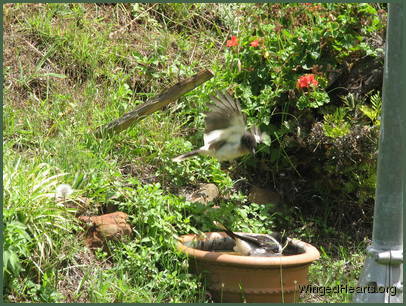 Billy magpies triplets fight non-stop with each other even though there's plenty of food for all. Their older sister Frieda on the other hand liked being given a piece just for herself. How does the bird behave when it sees you? Does it fly away and hide, or does it come up to you and talk? Renu noisy-miner would come and sit at our feet, while his younger brothers Renutu would hover over our shoulder. Each bird also makes a unique signature sound which acts like a name. Listen for these calls. As you name your birds, they will respond by trying to imitate your call for them. Often they integrate this into their signature sound making it much easier to recognise them. The birds like being recognised, it is part of building a personal connection. As you observe the birds, a picture will start building up and you'll get to know most of them quite well. As you get used to looking for these signs, we'll get better at recognising the birds. They will also become comfortable in your company and will start seeing you as a friend. for Part 4 on Identifying your bird click here. Permalink Submitted by Inspiring Speak... (not verified) on 18 June, 2010 - 01:19. I never thought about the birds personality before but now that you mention it they all have unique and distinct personalities. I like to look at it from the point of view of the bird. Bossy, in charge, loving or light hearted they establish there relationships with us and each other as they display their personality. Thank you for allowing me to see our feathered friend from a different point of view.